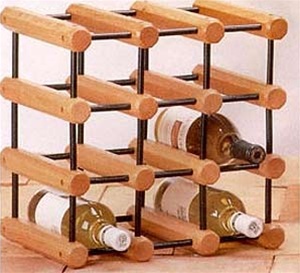 Convert unused space into well organized and handsome wine storage. Manufactured with precision for perfectly fitting parts, our solid hardwood wine racks are expandable, flexible and built to grow. 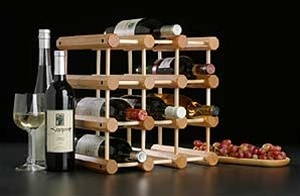 Choice of Octagonal unfinished beams with natural Oak (shown) or finished black pins (Click Here to view) cradling each bottle securely and make assembly easy. Choice of (a) 6-bottle at 4 slots (b) 12-bottle (shown) at 9 slots (c) 40 bottles at 35 slots. Each slot is assembled as 4" square. The octibeam is 1.375" wide by 11" deep. Therefore, the width/height of any rack may be calculated by multiplying the number of section by 4" and adding 1.375". For example, as shown the exact height/width of a 3 column/row rack shown is 13.375"